Phylum: Myxozoa, class: Myxosporea, order: Bivalvulida, suborder: Variisporina, family: Myxidiidae, genus: Enteromyxum. 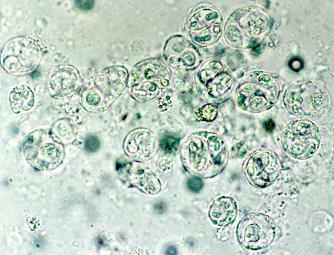 Enteromyxum leei spores in the gut of sharp snout sea bream (fresh smear of gut content x400). 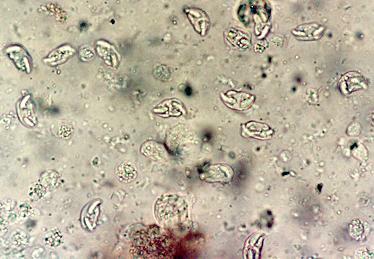 Enteromyxum leei sporogonic stages (disporic sporoblasts) in the gut of sea bream (fresh scraping of intestinal mucosa x400).